Rick and I are preoccupied with toys. We cannot get enough of playing with Noah and we want him to enjoy every minute. I don’t think that either one of us realized how we would use toys to help our child develop and reach his milestones. I think every developmental toy from Toys ‘R Us has visited our home; however most have not made the cut and had to be returned. I think I have a pretty good feel now for what Noah likes and what will be helpful. Take for example a xylophone that has spinning wheels to play the keys; I knew Noah would like it AND be able to use it. Knowing what your kid is capable of doing and what interests them is key. Noah really enjoys bright lights like the one his occupational therapist sometime uses. Finding a toy with multiple lights has been a challenge for us. If anyone knows of a keyboard in which ALL the keys light up please let us know. We even own our own rody horse! This toy obsession has led to a little bit of a problem at our therapy sessions. We are known for going straight to Toys ‘R Us after a session and buying whatever toy he just used. The majority of our toys are purchased this way, and it gets pretty expensive. 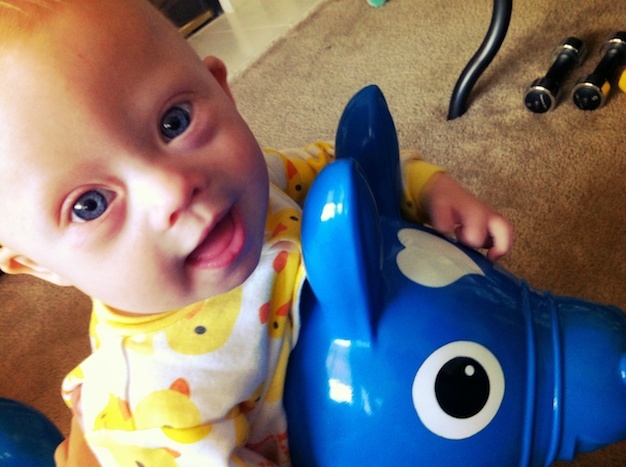 We even bought Noah a rody horse after he rode an elephant at physical therapy! I have started looking at Once Upon a Child for toys which is a great way to find cheaper (but effective) slightly used developmental toys! The xylophone mentioned above was one of those finds. If Noah Says It Is A Toy, Then It Is. This week I was wondering what new thing we would be presented with. To my delight Noah was completely entertained with a piece of paper. (Which I totally have already at home!!) And if he rips it, I have plenty of back ups. We have not yet experienced Noah being more entertained with the boxes than the toys, but I am sure that time is just around the corner. And thanks to Anna we now know that boxes can definately help out with development. 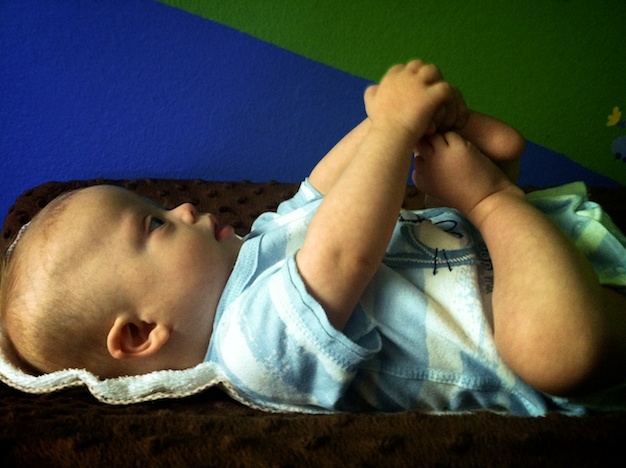 Even feet can become a fun toy if Noah says so! What is your child’s current favorite toy? What is a surprising item that entertained your child? My husband has to keep me off amazon.com after visit with friends, therapists or evenreading your blog. I too want to get EVERYTHING that could potentially help our baby! Paper is julian’s favorite! He likes to try to eat it. sometimes he succeeds. PS how are boxes good for development? And I love ellie bellie bear and anna and family! Look at Anna’s comment on the cheap developmental tool post 🙂 She has great suggestions for boxes. When my now-38-year-old daughter was a baby, there was a joke that she never received a toy that was just a toy – everything was educational or developmental. That was true, but it was also great! She learned so much from the things she was given, and that makes all the difference. And, yes, it is easy to see what “works” and what doesn’t. Keep on sending these videos; they are wonderful! You are a trip about buying the toys! I was like that after speech therapy one day. I just HAD to run to IKEA to get those wooden stacking rings. It had to be THAT day. They were cheap so it worked out. We use Once Upon A Child too 🙂 Ellie’s favorite toys are those wooden stacking rings (or any stacking rings) and nesting cups. She used to throw the cups but now she just loves nesting them. As for paper–like Gretchen’s little Julian, she eats it. She must need the fiber 🙂 Oh Tupperware–to bang on, to wear as a hat, to put things in.